Fill out all the necessary details. You will need to give your name, address and website url. Mail Chimp heads over to your site and puts together a fun color palette for your newsletter based on your site! 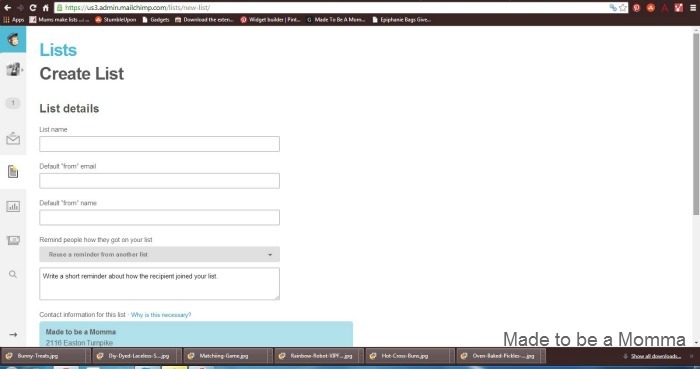 A form is where people will sign up to receive your newsletters. See my example right here! A template is the design you make for your newsletters. Once you create one template you can save it for future emails! A campaign is the term for an email sent to one of your lists. 4. Create a Sign up form. In the “Build it Stage” you will be able to add what components to include in your form. Remember…the less information someone has to give the more likely they are to fill out the form. I have four entries they need to fill out– “Email Address”, “First Name”, “Last Name” and ” How would you like to receive your updates ( because I also have my RSS FEED linked to Mail Chimp—you would just skip that last entry. I also opted to un-check the ” Let Subscribers pick email format” ( plain or html) box because some readers were getting confused and didn’t know what to choose so they opted to not sign up at all! 🙁 You will find the box in the left side corner. Notice the box that says “Sign Up Form Url” this is a great url to have for social medias, setting up a Hello Bar and more! 5. Share your Sign up form with your readers! Once again, go back to your Mail Chimp Dashboard and click on “List” again. Next, click on Design Sign up Forms and then click on “Embedded forms” which allows you to copy and paste a code into a widget for your blog! Select with list to send the campaign to. At this point you will only have one list. Give your campaign a name and an email subject such as ” Made to be a Momma Newletter” you’re readers will not be able to see what the campaign name is but they will see the email subject. Click “next step”. You now can choose between hundreds of pre-made campaign template to play around with or choose a “basic template” where you will start from scratch. To edit your campaign simply drag and drop the selections you desire and double click to edit! Have fun playing around and trying different set ups! You can insert a Campaign header, text boxes, images, social media buttons and more! Don’t forget to save your template for future campaigns for easy editing! Click “confirm” when you have your campaign just the way you want it. You can either send your email out right away or schedule it for a later time! I apologize for the LONG post but I promised it would be easy! I like to break things down in multiple steps. It may be more reading but normally results in less confusion! 🙂 If you have any questions please don’t hesitate to ask! I’m definitely not a pro, but if I don’t have the answer I promise I will try to find it! I hope you will stop by Made to be a Momma! I would love to have you! 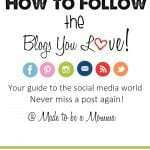 For more blogging tips check out these posts! How to set up a email signature in google mail. I’ve been trying to learn how to create a newsletter by reading countless articles. Finally, this is one I can actually understand! I would love to know more about the plugin, too. Great post! I am so glad it was easy to understand! It was a lot of information! 🙂 I haven’t researched much into the plug in yet but I plan on diving into it soon! I have been thinking of making a newsletter so this is great information… Pinning this so I have it when the times come that I can sit down and figure out how and what I should do. Thanks for sharing. You are a mind reader! 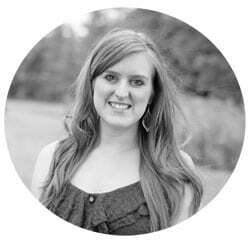 On my to-do list from BlogHer “figure out how to create a newsletter”. Printing and pinning. Thanks! Excellent post! 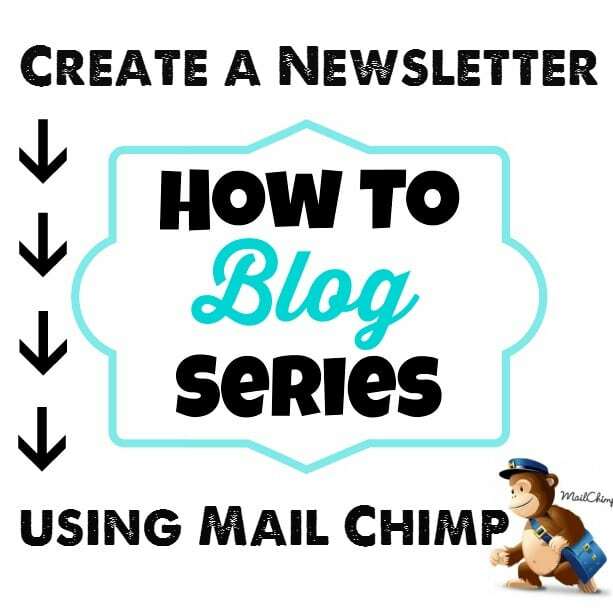 I’m working on learning MailChimp for my own newsletter as well as for a few businesses, and this was a great starting guide.